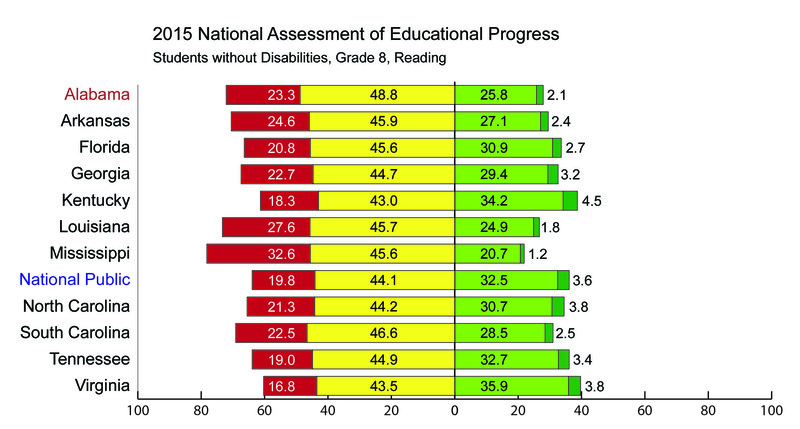 Alabama School Connection » How Come Other States’ Students with Disabilities Do So Much Better on the NAEP? 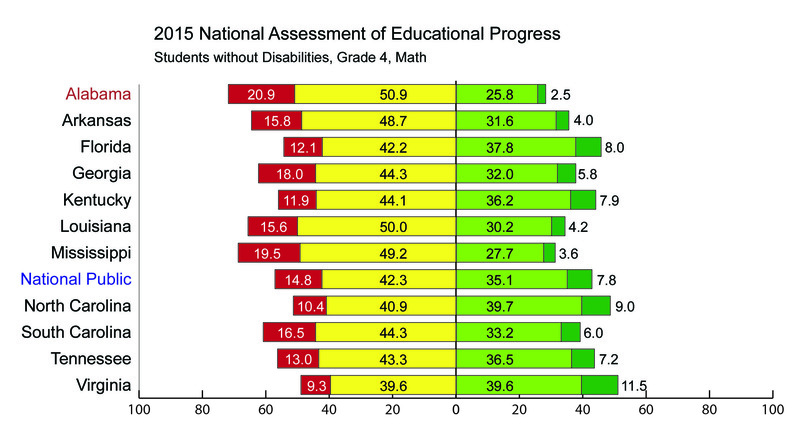 Having heard lots of excuses justifications reasons for why students with disabilities score poorly on the Alabama-mandated ACT Aspire, it’s time now to look at the National Assessment of Educational Progress (NAEP) to see how Alabama’s students with disabilities perform when compared with other states’ students with disabilities. We already know that Alabama’s students score poorly on the NAEP. And we already know those low scores cross all racial, socioeconomic, and ethnic groups. Add disability status to that list, too. 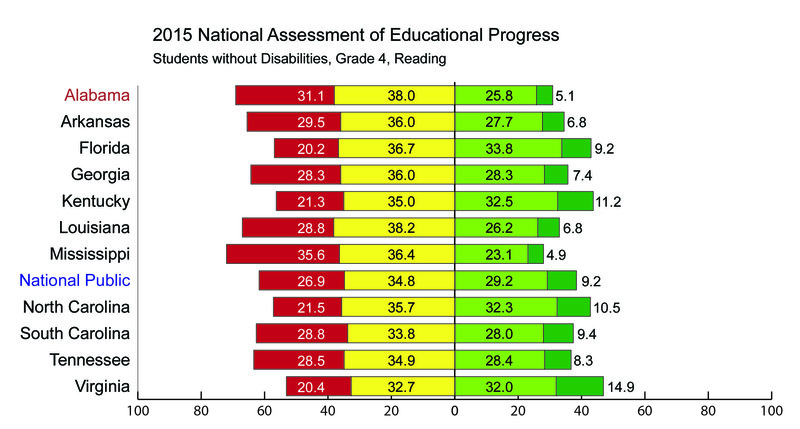 NAEP is the only test that can be used to make real comparisons from state to state. It breaks out scores not only by scale score, but also by four levels of proficiency: below basic, basic, proficient, and advanced. “Proficiency” is the goal to achieve, and students scoring at either the proficient or advanced level meet the “proficiency” benchmark. 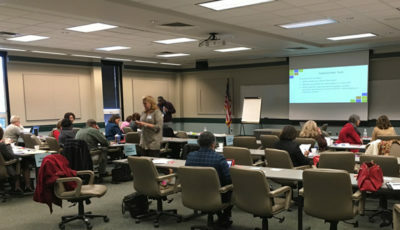 Accommodations are allowed for students with disabilities. 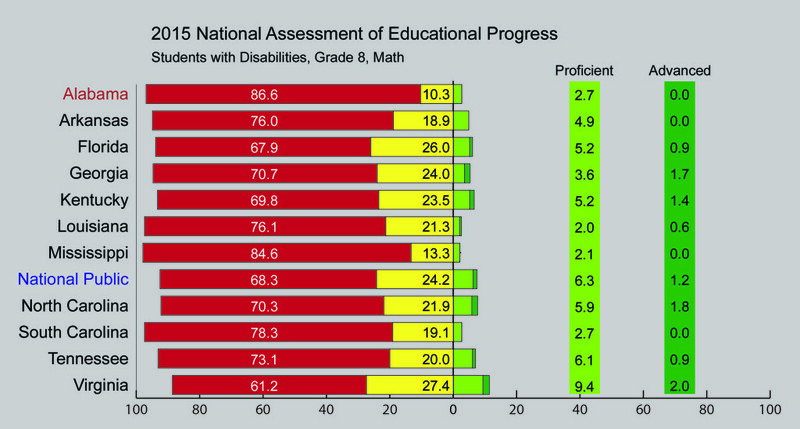 Looking through NAEP proficiency levels, we found Florida, Georgia, and Kentucky (to name a few) all have considerably higher percentages of students with disabilities who meet the proficiency benchmark. 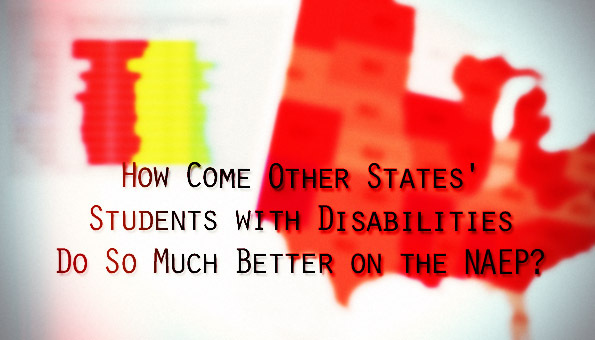 What are the educators and administrators in those states doing differently for students with disabilities? 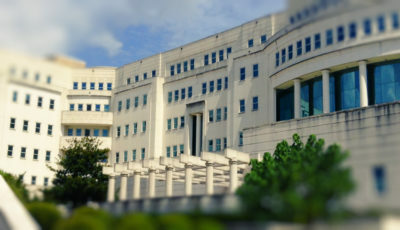 We plan to find out during our year-long look at the state of special education in Alabama. 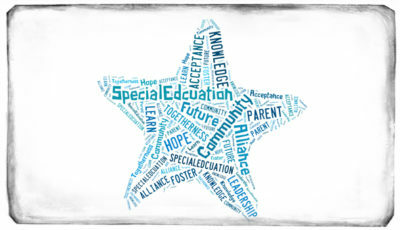 If you know of successful special education programming, goals, plans…please share with us via email, asc(at)alabamaschoolconnection.org. 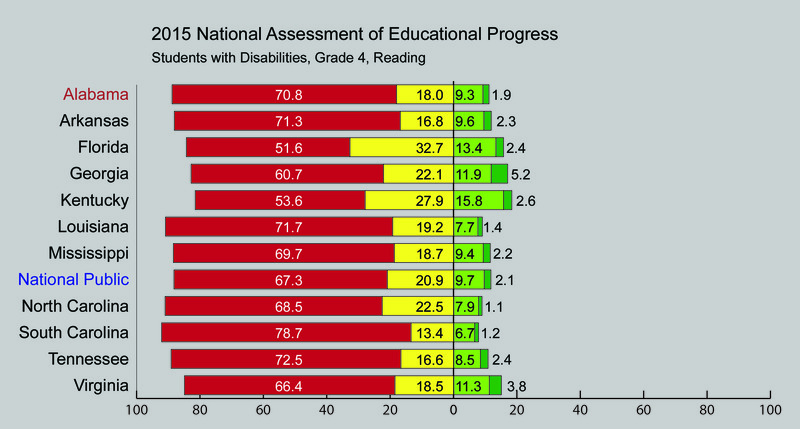 The charts below compare Alabama’s students with (gray background) and without (white background) disabilities in grades 4 and 8 in reading and math with nearby states and with the national public school percentages.. 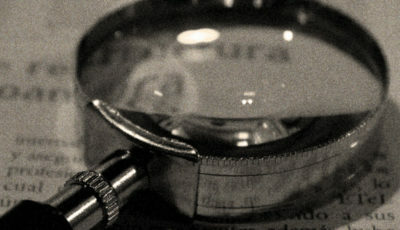 The midpoint of each chart is marked with a zero (“0”). 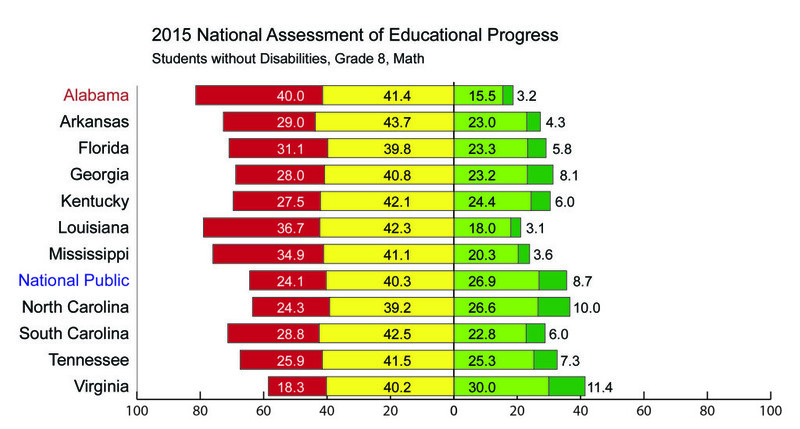 To the left of the “0” is the percentage of students that have not reached proficiency (below basic or basic). To the right of the “0” is the percentage of students that have reached proficiency (proficient or advanced). What follows is first the legend, then the charts. Below the charts, there is an interactive to allow you to make comparisons across all states. Here you can choose a few states at a time to compare NAEP proficiency levels for students with and without disabilities. 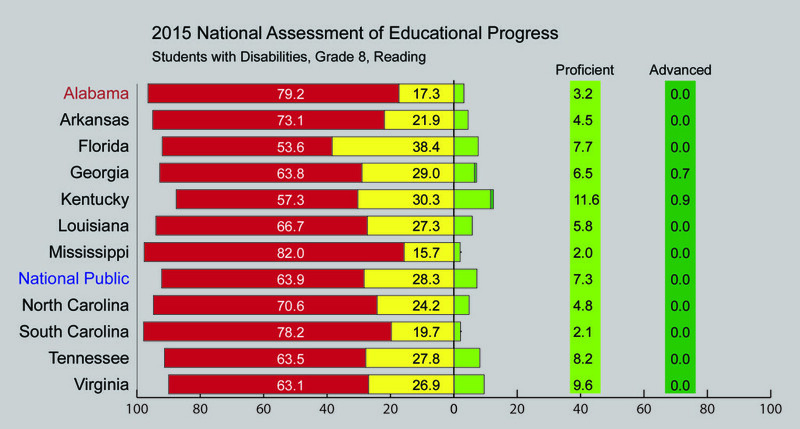 Here you can view NAEP proficiency levels only for students with disabilities across whichever states you choose. 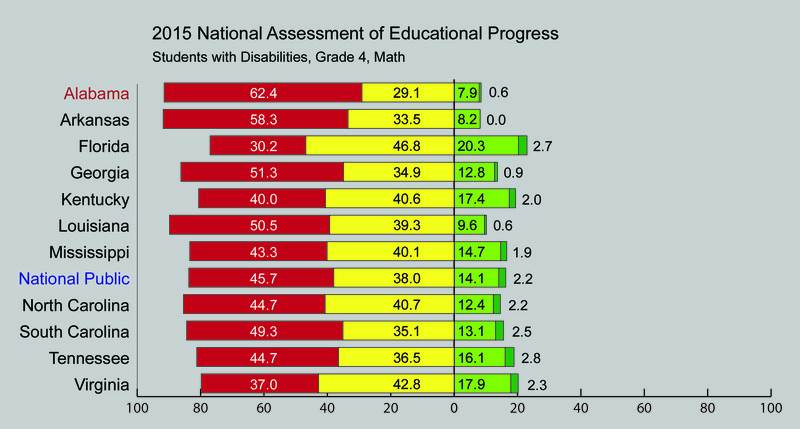 Finally, here’s a map that shows you the percentage of students with disabilities that scored at the proficient and advanced levels, combined.